Another day, another selection of sights and sounds that are uniquely New York. Sam’s mom Cindy drove us into the city yesterday afternoon to a hotel in Brooklyn, where we’d be spending New Year’s Eve. For my visit, Sam purchased tickets to the Bootlegger’s Ball, a party held in an old church that was 1920s/30s themed. Since we were in a car instead of the train, I had a different view of New York on the way in. Seeing Manhattan from the freeway all lit up was a magnificent sight. The Empire State Building was lit up with dozens of changing lights, as if it were a spinning disco ball of color. We checked into our hotel with ease. Once we got to our room, however, it was quickly obvious that the thermostat was broken. We called the front desk we were put in a different room immediately, so we quickly gathered our things and moved up six floors. Not only did we have heat, but the view was much better! We dressed in our finest and went to dinner around the corner at a little place called Junior’s. The atmosphere inside felt like old town NYC and the food was fabulous! After a little research, I discovered the place had been open since 1929 and was even featured in a local pop-up book about Brooklyn sights. Not bad for a random “Hey, let’s just eat at this place” selection. The party was a few blocks away, so we walked. It was getting bitterly cold and the wind made things even colder. The streets were quiet, but not menacingly so. In fact, all of our walking around New York has been without incident. I haven’t even felt uncomfortable. Anyway, we arrived at the church, checked in, and took in the room. The crowd was dressed in a mixture of stylish costumes inspired by the 1920s, 1930s, and 1940s: fedoras, feathers, headbands, ties, pinstripes, furs, and spats. There was a band playing…or, more accurately, an orchestra. 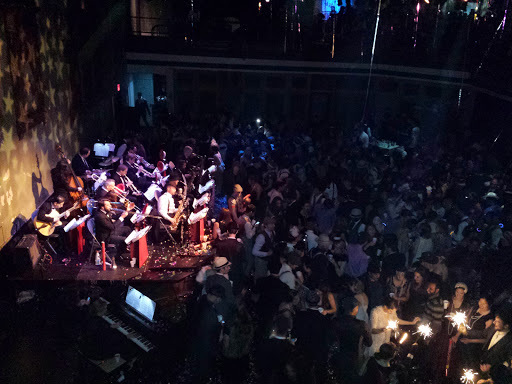 The 13-piece group played all manner of big band dance numbers with occasional interruption by burlesque performers, an aerial performer, and a strongman. Sam and I danced the night away and rang in the new year under a rain of paper and a cheerful crowd. It was all quite lovely, even though I can’t dance to save my life. New Year’s Day started with a startle. I hadn’t taken my nice camera down to the party, yet I couldn’t find it in the room. I tore the room apart and it was nowhere, even though I KNEW I brought it. Maybe I left it in the van on the way down? No, I was sure I had brought it to the hotel. The only answer that made any sense was that I’d unloaded it in our first room and missed it when we did our sweep before switching. Maybe the room had stayed empty. I called the front desk and mentioned our room switch and asked if it would be possible for me to look around the old room. The clerk told me the hotel was 100% booked and the other room was occupied. My stomach clenched and my heart sank. I just stood there, holding the phone and accepting the fact that my camera was gone. The clerk asked what I was looking for and I meekly said I’d possibly misplaced my camera. “Oh, the Canon?” she asked. I stood up straighter and said why, yes indeed, it was a Canon. The other people had turned it in. I am so grateful and thankful for the humanity of others. Cindy picked us up at about 10:30 and took us to our only planned destination for the day: Coney Island. 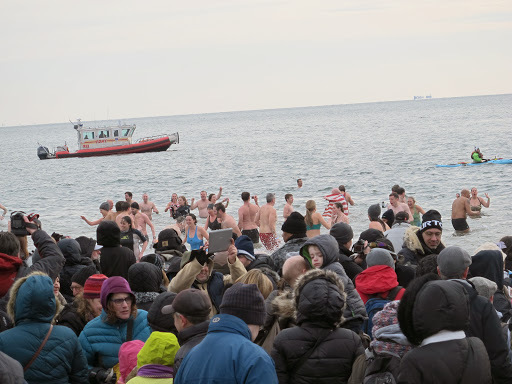 On New Year’s Day, the Polar Bear Club has their annual plunge into the icy waters. Even though it has been going on for over 100 years, it’s only ballooned in popularity the last decade or so. There were about 2,500 people there this year participating and many more spectating. It was 34 degrees out and the water was 41. Some people were in costume, some people went in with their families, and others spoke about tradition and had been participating for a long time. At 1:00, the first wave of crazy people hit the water. I cannot even imagine the feeling of hitting the water. I was super cold on the shore as it was. Still, it was amusing to see the shock on their faces. After walking the boardwalk for a few minutes and stopping into Nathan’s (omg best hot dog I’ve ever had) we headed out. We decided to make one more stop before heading back to Brewster. The night before, I had remarked at the landmarks at Flushing Meadows Park, so we drove over to check them out first hand. 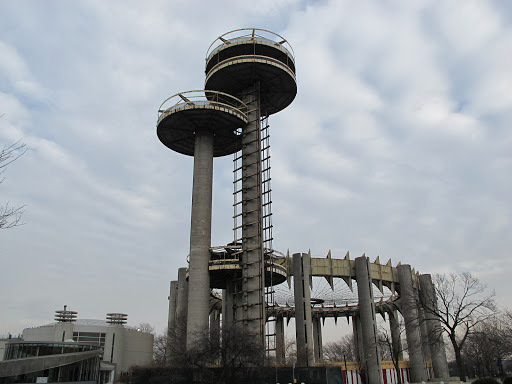 The park held the World’s Fair in 1939 and 1964 and left behind a few famous structures. It was empty aside from a few kids at the skate park and a Chinese couple getting wedding photos. We saw the Unisphere (a big ol’ globe) and the observation towers, which most people now associate with the film Men in Black these days. The towers are rusty and have been closed for almost fifty years now, as has the ‘Tent of Tomorrow’ ring around the bottom. I loved getting to look around the area and capturing it with my camera; since the fountains were off, I was even able to get up under the globe to get some shots. All in all, it’s been a lovely 24 hours. I am still hobbled, though, and am very much looking forward to a day of rest. This entry was posted in Travel and tagged Brooklyn, Coney Island, Flushing Meadows, Men in Black, New Year's Eve, New York, New York City, NYC, party, World's Fair. Bookmark the permalink.